TeamCME is an Accredited Training Organization for the National Registry of Certified Medical Examiners (NRCME) and is recognized by the PACE program of the Federation of Chiropractic Licensing Boards. The TeamCME Accredited Course for the National Registry of Certified Medical Examiners satisfies the FMCSA training requirement for MDs, DOs, DCs, APNs, and PAs to take the National Registry Certification Test but does not provide CME credits for the medical professions. The TeamCME National Registry of Certified Medical Examiner training is accompanied by PACE Continuing Education credit for the Chiropractic profession(as described above) in up to 26 states (see link below). Other TeamCME training courses may include PACE CE credits, see specific training descriptions regarding PACE certification. Prior to attending, check with your State Licensing Board regarding the acceptance of PACE CE programs provided by TeamCME or provided by a third party vendor sponsored by TeamCME. 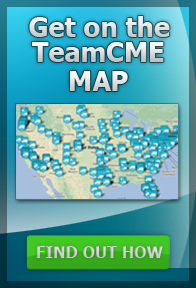 TeamCME National Registry of Certified Medical Examiner training live conventions may be sponsored by a State Association, University, or Chiropractic College. Sponsoring organizations may apply for CE hours where PACE accreditation is not accepted. Check with the sponsoring organization in regard to CE approval from specific states. 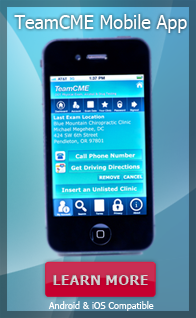 Confirm CE approval with your state licensing board for all TeamCME training. TeamCME “Distance Learning” (internet based) consists of Live-Teleconferences and On-Demand Webinars are hosted by ChiroCredit.com. CEs have been applied for most states that accept distance learning. Please contact ChiroCredit.com thru their website at www.ChiroCredit.com. Confirm CE acceptance with your state licensing board. Include in the inquiry the distinction between a “Live” and an “On-Demand” distance learning event as they are usually treated differently for CE credit. TeamCME sponsors the ManageCo OccMed Training for DCs. ManageCo is a third party provider for this training. PACE CE credits are available for this course in up to 26 States. Prior to attending, check with your State Licensing Board regarding the acceptance of PACE CE credits when provided by a third party vendor sponsored by a PACE provider (TeamCME). CME-1 Credit for this course has been discontinued. At this time, there are no plans in 2017 to offer CME credits for this course.